This section is not currently developed, but would introduce elements of photoshop that are more advanced, with topics that would be related to Print Design only. This would have special concentration on using photoshop with other design packages, and further explanation on maintaining quality of image. The user would be able to choose different prepared projects, and choose to construct or deconstruct the work. This would be supplemented with small bodies of text, offering explanation where necessary. Additional themes would be included, that have be iterated in the New Users section, but not fully explained. 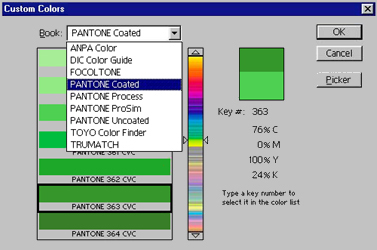 The Layers Palette and the Layers Menu are used together in order to access the options available for controlling the layer functions. Photoshop has three kinds of Layer; Adjustment Layers, Type Layers and [Image] Layers. 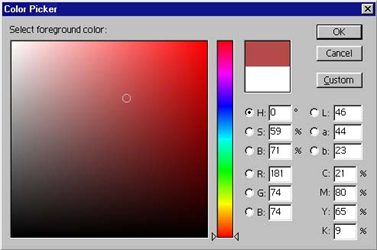 The order that the layers are placed in the palette effects what is displayed and the higher in the Palette the further 'forward' the layer is (this is known as stacking order). Layers that are further forward can have their 'paint' mode changed so that an entire layer can affect an underlying layer. Text layers contain any text elements that you create using the Type and Vertical Type tools. and can be dragged 'up' and 'down' the palette. Layers are deleted by dragging them to the Palettes bin. The Select menu offer additional options to those offered by the Options palette although Feather is duplicated. This tool enables you to create new paths and with modification keys can access all of the other tools hidden beneath it. Pressing the Control Key while drawing will temporarily access the Direct selection tool, so you can move an anchor point. After the first click a new 'work path' is created which can be seen and controlled via the Path Palette. Text Layers Maintain text in editable mode so they can be changed, although this still shows the type dialogue box. To do this double click (mouse button) on the layer you wish to edit. Any layer you wish to delete can be dragged from the palette to the palettes bin. Linked layers do not get deleted. No warning message is given either. Options for controlling how the palette will display (if thumbnails, how big. In addition you can choose many other options that are repeated in the Layers menu (top of screen), However many are more convenient in this position, such as Merge Linked layers, which merges linked layers.. Most important option is Flatten Image. For many File Formats you need to to flatten Photoshop layers in order to be able to save your work. This is normally done at the last moment as it has the effect of turning all layers into one, background layer. Between many layers you can control how the your current layer and other layers behave between each other. Any layer above another, will normally (Normal) hide any underlying pixel information. However with this menu you can alter this. For example, if you chose to combine with Lighten only the lighter (than the underlying) pixels in the upper layer would be shown. Best plan with this is to experiment. As an alternative to simply applying Adjustments from the Image~Adjust menu (top of screen), you can create an adjustment layer, which can be edited at a later stage. Choosing to create such a layer opens a dialogue box, giving you the option as to which adjustment you wish to make. To edit changes later, simply double click the layer (mouse button). All layer kinds can be turned visible or not by clicking on the 'eye' to the right of the layer. Care should be taken, as this does not make the layer inactive, and you can make changes by accident to hidden layers. All layers can be linked and do not need to be consecutive. Linking layers means that they can be moved as one (Move Tool), and you also have some choices such as Merge Linked layers from the Palette menu. Active layer: only one layer can be the active layer, and is the layer you can edit at that point. Double clicking type and Adjustment layers makes them the active layer.